Why should I donate to C.A.T.S.? What does my donation go towards? C.A.T.S. is a non-profit organization dedicated to saving cats in need. Our volunteers work their tails off to keep every cat in our care safe, healthy, and happy. However, most of the cost is covered by their own personal funds. Your donation helps us provide food, litter, comforts, vet care and medical treatment. Please consider donating to this wonderful cause!! C.A.T.S. is a registered member of the Amazon Smile Foundation charity. Please click org.central to transfer to Amerizon Smile site to sign up for FREE. Once you have signed up, search for “Cat Adoption Team Services” and select the E. Providence, RI location. Thanks greatly from us and our cats/kittens for your time and foresight to help support this life saving service. You can donate online HERE. Check out our Crowdrise site often for fun giveaways and cool contests! You can pick out something great from our WISHLIST. You can also decide what your donation goes towards! You can choose TNR, Vet Assist, Spay/Neuter Assist, the Robert R. Falaguerra Memorial Fund (dedicated to help animals in need of immediate care due to trauma, abuse, or life-threatening illness), or whatever else you decide!
" I'd like donations made to get me a sparkling new collar and some high quality cat-nip!!" 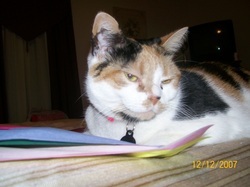 -Ophelia Cotoia, rescued by C.A.T.S in 2006! NOTE: Ophelia doesn't actually need any donations. She has a home and is very spoiled!